Inscription at the Cox Corridors, U.S. Capitol, Washington, D.C. Photo: Franklin K. Donovan. Source: Wikimedia Commons. Recent events have thrown free speech questions into the headlines: the threats against theaters that had planned to screen Sony’s The Interview; the PEN surveillance study showing that authors all over the world feel constrained by the presumption that their online activity is being monitored; the flogging of Saudi blogger Raif Badawi, sentenced to ten years in prison and a thousand lashes for “insulting Islam” and “founding a liberal website”; and most agonizingly, the Charlie Hebdo massacre. A streak of American commentary has dwelt on whether the “free speech” called into question by North Korea and the Islamic extremists in Paris is good enough to warrant protection (a question no would-be pundits have posed about Badawi). 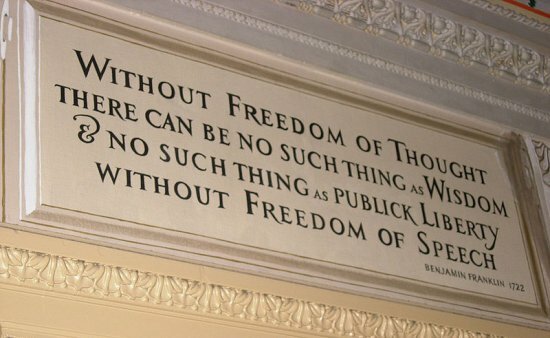 The prospect of either a foreign government or a cabal of terrorists threatening freedom of speech in the United States through mortal fear represents a chilling breach of our civil liberties and national autonomy, whether the material that provokes it is sophomoric or not. Questioning the quality of the offending work is even more problematical in the wake of carnage. To say, “These murders should never have happened, but the Charlie Hebdo cartoons are obnoxious” trivializes the lives that were lost, even if it is done with a nod toward the tragedy, because it conflates the dangerous speech that provoked the terrorists to violence with the distastefulness of the cartoonists’ chauvinisms. Many who belittle the content of Sony’s film or the French cartoons of Mohammed seem to imply that while we should not be censored by law or the threat of violence, we should self-censor. It’s hard to argue with this; I am constantly telling my children which unkind observations are better left unexpressed, and consider it a mark of maturity not to say such things. Oliver Wendell Holmes’s famous epigram about “shouting fire” is often condensed to lose much of its meaning. He said, “The most stringent protection of free speech would not protect a man falsely shouting fire in a theater and causing a panic. […] The question in every case is whether the words used are used in such circumstances and are of such a nature as to create a clear and present danger.” Note that Holmes’s delimitation rests not only on danger, but also on falsely; it is perilous fabrication that he calls into question. Hate speech is dangerous — Holocaust deniers or the KKK, for example, sow great darkness, and my time in Rwanda taught me how easily propaganda can drive ordinary people to appalling acts. The rhetoric of the Putin government, which recently deprived transgender Russians of the right to drive, is poisoning the many against the few as a means of funneling away the anger that should rightly be directed at the regime itself. Speech can be exploited to achieve terrible ends. I wouldn’t write if I didn’t believe in the power of words for good, and if one accepts that capacity, one must also recognize their potential to inflict damage. Words break bones. But I came of age in the time of “Silence = Death,” the rallying cry of the 1980s AIDS activists, and I believe that muteness is in general more toxic even than speech. Pope Francis and David Cameron have each proposed new standards for limiting freedom of expression, and their intent seems to be good. But Badawi’s flagrant punishment derives from his government’s notion of civility, propriety, and security, and we should avoid comparable expurgation. If we are to err in one direction or the other, let us err in the direction of vulgarity, of obscenity, even of mean-spirited prejudice, and not in the direction of closedness, of being afraid to speak out, of a propriety that obliterates what writers, artists, or citizens believe to be uncomfortable truths. Counter­intuitive though it may seem, liberty of discourse leads to justice more readily than well-intentioned, enforced control does. Grievous lies and incitements to violence need to be checked. But the film and the cartoons offend primarily against taste and high-mindedness, as do many artistic masterworks. Decorum should always be a choice. Its violation cannot be a punishable infraction, nor grounds for mitigating whatever else you say about slaughter.